We have digitally restored the original ‘Some of the Palestinians’ – a 55-minute documentary directed and edited by Mamoun Hassan when he was stationed with the United Nations Relief and Works Agency for Palestine Refugees (UNRWA) in Lebanon in 1974. The film opens with a day in the life of Dr Murad, a Palestinian doctor appointed by the UNRWA to look after the health of the Palestinian people in a Syrian refugee camp. It progresses to a recently bombed camp in Lebanon to the West Bank, via Jordan. The crew members and in Lebanon, the cinematographer, were Palestinians working in UNRWA’s Audio Visual Division, the rest of the film was shot by Ernie Vincze, the distinguished British documentary and feature cinematographer. I landed in Beirut with my wife and young family on 19 April 1974 to take up my appointment as Head of Films Branch, UNRWA (United Nations Relief and Works Agency for Palestine Refugees). A leftist leader had been assassinated in South Lebanon the previous day and that event is regarded as the start of the civil war. A few days later I drove down to Nabatieh Palestinian refugee camp in South Lebanon to film the consequence of Israeli bombing. The camp had been obliterated. A few days later I filmed the effect of bombing in Rashidieh, a camp further down the coast near Tyre. The brief was to document the services – Housing, Education, Health, Rations – that UNRWA offered the Palestinian refugees. My immediate boss and chief of the AV division was the legendary Myrtle Winter-Chaumeny (writer, photographer, sailor, dancer); the director of Information was John Defrates, the bravest man I have ever met, who was a Navy pilot in the icy waters near Vladivostock during WWll. I was given a fairly free hand but editorial control rested with UNRWA. What I saw in South Lebanon and elsewhere gave me the form of the film: the experience of life in the camps in Lebanon, Syria and Jordan – but not the West Bank because Israel refused me entry. Myrtle filmed that sequence. So the story is about war in Lebanon; life in one the oldest camps near Aleppo established in 1948; work in Baqa’a in Jordan which accommodated thousands of fleeing refugees after the 1967 war; and education in Ramallah. Mamoun is keen for people to view this film. It is a timely reminder that UNRWA’s humanitarian work is not done, despite the decision of the US administration to cut $300 m from its planned annual contribution to the UNRWA budget in 2018. The restoration was made from an answer print of the edited film. This version did not have English subtitles for spoken Arabic. By referring to the only other known copy – a print held at the National Film Archive – we were able to transfer the subtitles exactly as they appeared on the film, which was invited to the London Film Festival in 1976. This is an interesting selection of films from Jason Ward on Dazed, that have been recognised as ‘defining’ the UK. Whilst it is pleasing to see ‘My Brother the Devil’ on which Mamoun acted as Consultant Editor, it is wonderful to see ‘A Private Enterprise’ on the list. Mamoun backed ‘A Private Enterprise’ during his time as Head of Production at the BFI. It doesn’t get the exposure or recognition that it deserves – until now. Whilst it isn’t available to view on the BFI Player yet, we are sure it will at some point. Here is a chance to listen to the discussion that Mamoun had with Terry at the showing of his first film ‘Children’ on 16th March this year. Terry was, as always, charming, funny, witty and illuminating. Mamoun and the audience had a wonderful hour with Terry, taking him away from post-production of his latest film. Special thanks must go to David Somerset of the the BFI for curating the event – It couldn’t have happened without his involvement. I am presenting Yasujirô Ozu’s An Autumn Afternoon on Friday 23rd May at National Film Theatre 3, BFI Southbank, London 2 pm. There will be a Q&A after the screening. 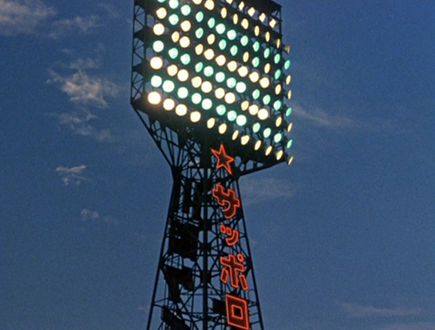 An Autumn Afternoon is Ozu’s last work and one of his few colour films. It is Ozu at his most distilled. All the elements and style of shooting combine to elicit total attention from us. And he gives us time, through the use of space – empty corridors, rooms and exteriors – to consider and reconsider, to think about what we have just seen. When normal service of cinema and television is resumed, you’d think the world has gone mad, suffering from ADHD or under the influence. Ozu’s films are not only journeys into his mind but also into our minds. For more information and to book online visit the BFI website. Mamoun made one of his regular visits to the European Film College in Ebeltoft, Denmark, to deliver masterclasses and his now well known movie introductions. One of the introductions was to Antonioni’s classic L’Avventura. Many thanks to Georgi Yordanov who filmed the event, and the staff and students of the European Film College. Dominic Power, Head of Screen Arts at the National Film and Television School, invited me to provide an introduction to Antonioni’s L’Eclisse on 3rd March as part of NFTS/NFT’s Passport to Cinema. I would like to thank David Somerset of the BFI for making the record of the event, and for his continued support. On 17 August 2013, I presented the long-awaited Masterclass on Satyajit Ray’s Pather Panchali at the British Film Institute (BFI) Southbank’s National Film Theatre. As I explain in the introduction, I’ve never presented a Masterclass on Pather Panchali before. Maybe because the film is just too ‘big’ and too rich to digest in so short a time as four hours. You can view the 10 minute introduction to the film here. We hope to have the opportunity to broadcast the full Masterclass to the wider public at some point in the near future. The film and Masterclass were presented as part of the BFI’s continuing education programme curated by David Somerset, the Education Programmer and Curator at BFI Southbank (who also shot the introduction). Movie Masterclass is moving to a new home!